workout. You can lift as little or as much as you can by changing the angle of your body. It allows you to switch from one exercise to another without consuming allot of your workout time. With a simple adjustment of the detachable handle to any one of the five rings on the main strap and you’re on to the next exercise. With it’s unique dual strap design you can perform dips, chin-ups and pull-ups. What I appreciate about the Human Trainer Suspension Gym is that it doesn’t take up a lot of room. It’s lightweight and portable so you can travel with it. It also has an attachment so it can be used outdoors. 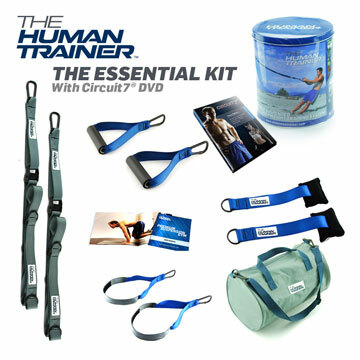 I really enjoyed the Human Trainer and give it 5 out of 5 stars. If your thinking about getting a suspension gym for your home or business. The Human Trainer will give you more value and challenge your body by delivering more exercises, that are unavailable with other suspension gyms. 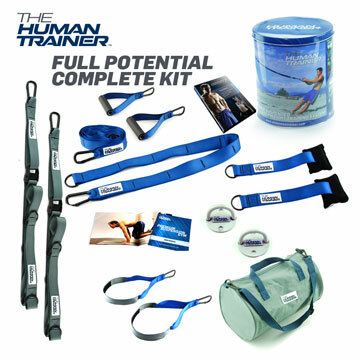 The Human Trainer Essential Kit is being sold at price of $169.99 and comes with 2 x Main straps, 2 x Door Anchor, 2 x Handles, 2 x Foot craddle, 1 x Handbook, 2 x Ebooks, 1 x Travel Bag, 90 Day Money Back Guarantee, 2 Year Replacement Warranty & Circuit7® The Human Trainer DVD. Plus Free Shipping within the US. CLICK HERE TO FOR MORE INFORMATION AND TO BUY. Plus Free Shipping within the US. CLICK HERE TO FOR MORE INFORMATION AND TO BUY.